How to build a beautiful hexagonal pergola, with radiating rafters! 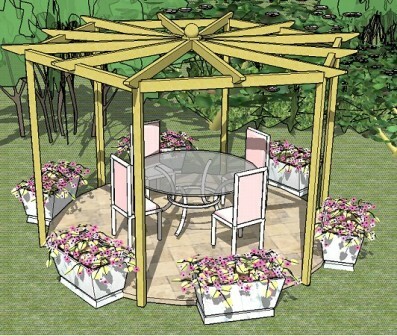 Build this fabulous hexagonal pergola in your garden, either as a freestanding feature or against a wall. This pergola design can be built with six or twelve radiating rafters, and looks stunning in either setting! The plans include step-by-step hexagonal pergola plans for beginners, 18 rafter tail templates (for both 4" and 6" deep rafters) and construction templates for the braces and angled centre points.